Lawmakers want to make it illegal for one to encourage bad behavior toward another person by posting information online. You have a falling out with someone, who then posts information about you on the Internet, and encourages others to harass you. It could happen, and there&apos;s no law against it … yet. 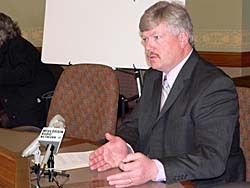 State Representative Donald Friske (R-Merrill) testifies to the Committee of Criminal Justice that his bill (AB-51) would prohibit certain computer messages which invite harassment or obscene, lewd or profane communication. Friske gives an example of how one couple broke up and the guy posted information about the girl online and encouraged others to harass her, which they did. Representative Fred Kessler (D-Milwaukee) says the &apos;intent&apos; is not punishable, but the &apos;action taken&apos; because of the posting is punishable. Friske says his bill would make it a Class A misdemeanor.